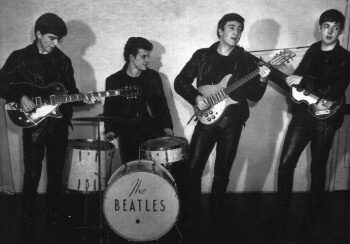 Pete Best on why the band wore leather gear and not suits: "When we went over to Hamburg, we found out that the stage suits we had actually rotted and fell apart with the long hours we were playing. Leather was a lot cheaper in Hamburg. We could wear it on-stage and off-stage. We basically lived in it. And it enhanced the image we wanted. When we went back to Liverpool, all the other bands were still in stage suits and gold army jackets and such. We came in with cowboy boots, tight jeans, leather jackets and hair grown long, playing this powerhouse music. It ranked us fairly high in the eyes of the girls of Liverpool."